Each day is a new start... to start fresh, and leave the worries of yesterday behind you! Today I am thankful for a new day, a new beginning, a new start, and the ability to make new choices! "Don't start your day with the broken pieces of yesterday. 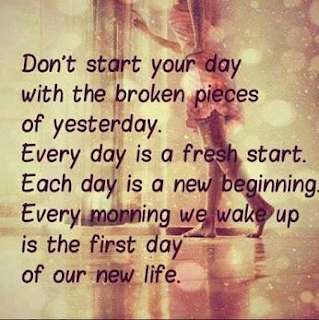 Every day is a fresh start. Each day is a new beginning. Every morning we wake up is the first day of our new life!" How will you start your brand new day?